An 83-year-old retired Marine kept a promise he made to a fellow officer while they were hunkered down in a bunker during the Vietnam War. Retired Marine Master Sgt. William H. Cox and Retired Marine First Sgt. James 'Hollie' Hollingsworth were shielding themselves from rockets and mortars in 1968 as they were fighting in the Marble Mountains during the war on New Year's Eve. The two men, who were strangers to each other, had decided if they made it out of the bunker and survived the war, they would contact each other every New Year's Eve. For the next five decades they kept that promise - every New Year's Eve they would catch up life's happenings. Earlier this year, Cox traveled from Piedmont, South Carolina to see Hollingsworth in Hephzibah, Georgia. The 83-year-old made the trip so that he could say goodbye to his dear friend who was dying. For five decades, Cox (above in 2011) would speak to Hollingsworth on New Year's Eve after they became close friends during the war. While saying his final goodbye to Hollingsworth earlier this year in Georgia, he asked Cox to deliver his eulogy and stand guard at his funeral. He accepted and said: "Boy, that's a rough mission you're assigning me to there"
While visiting, Hollingsworth asked his buddy to make him one last promise. He asked him to stand guard over his casket and deliver the eulogy at his funeral, to which Cox accepted. 'I said, "Boy, that's a rough mission you're assigning me to there,"' Cox told Greenvilleonline.com. Cox, who served in the Marine helicopter squadron VMO-2 with Hollingsworth, made sure to keep his final promise when the time came and it did. 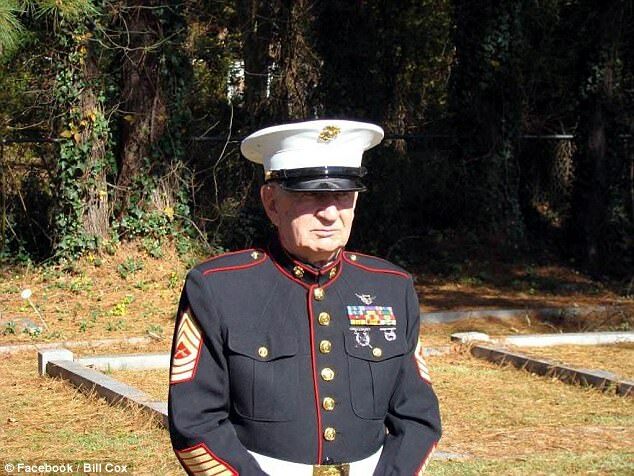 The 83-year-old put on his dress blues and stood guard over his friend's casket during his funeral service earlier this month. He also delivered a heartfelt eulogy for Hollingsworth - whom he flew numerous combat missions with during their time in the Marines. 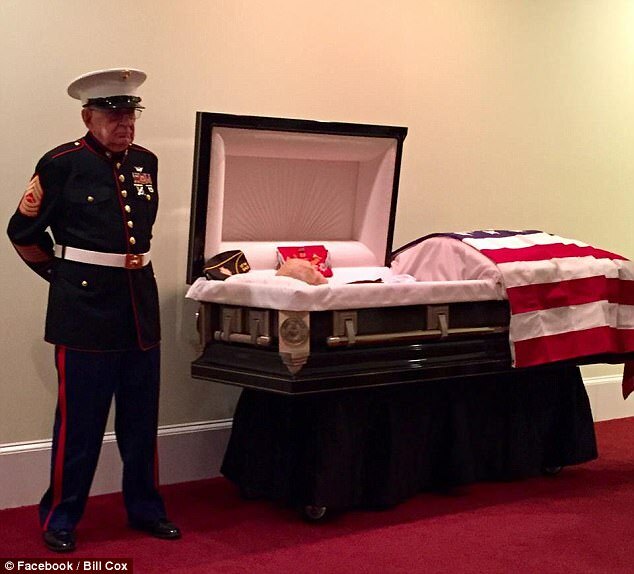 A photo taken of Cox standing next to Hollingsworth casket was shared to Facebook by his son, Bill Cox. 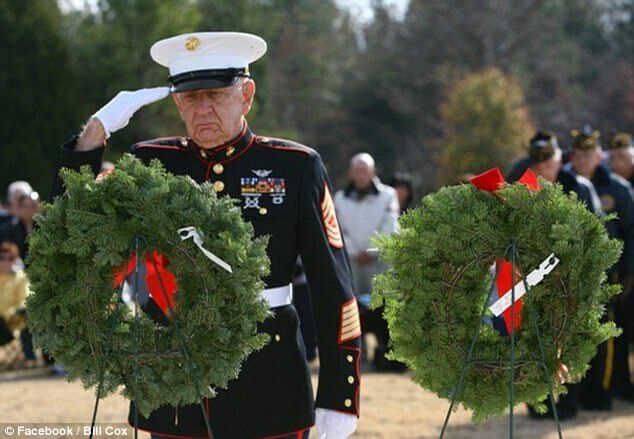 'My 83 year old father, Master Sergeant William H.Cox, USMC, Retired, honoring one of his Vietnam brothers, First Sergeant James J. Hollingsworth (Hollie),' he captioned it. 'They made a pact to stay in touch, if they survived their tour, and they did. Both were door gunners, and dad was the only enlisted man in VMO-2 to be awarded the DFC in Vietnam. Since sharing the photo on November 5, the emotional photo has been shared thousands of times with many fellow Marines saluting the pair for their service. Last edited by Coolwalker; 11-16-2017 at 02:38 PM. Wow, he still looks good in it. No way could I fit in my uniform after 40 years since I'm about 20 lbs heavier since I got out. Thanks for this piece @Coolwalker. Touching to say the least. Makes me even more angrier at today's snowflakes and the rest of the leeches.